God is not done with his work when we first believe and are saved. He intends day by day to make us into what we already are in Christ. Spiritual growth is not optional or marginal in the Christian life. Every person that truly believes in Christ is increasingly transformed into his likeness. The Bible uses hundreds and hundreds of metaphors to help us understand the Christian life. In these verses, Peter talks about “spiritual milk” (1 Peter 2:2). When you come across a word picture like this, press on it to see all that the author wants you to see about the truth being depicted. Explain the “So” (or “Therefore”) at the beginning of 1 Peter 2:1. How does this first verse of chapter two build on the last verses of chapter one? Explain Peter’s milk metaphor in 1 Peter 2:1–3. What is the milk? And what role does it play in the Christian life? 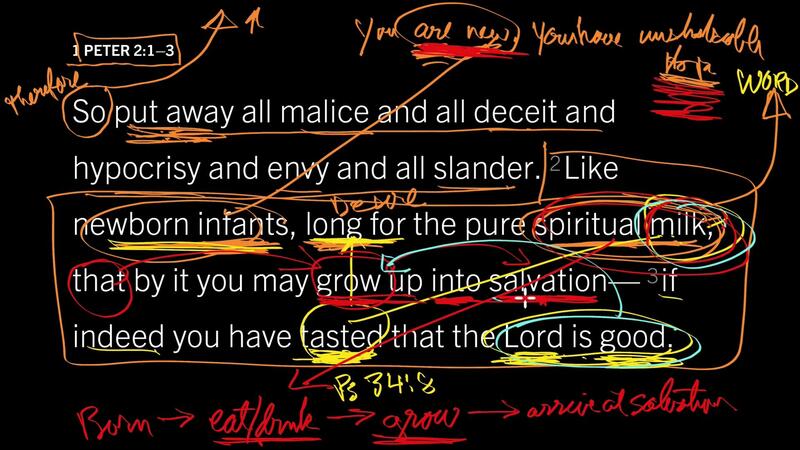 Looking at 1 Peter 1:5, 9; 2:2, explain how Peter is using the word “salvation.” What seems different about the way he is using it, and how would you explain how it fits with other places in the Bible that talk about our salvation? Because you are already new in Christ, be about becoming what you are. The same word that brought us to life sustains us each day. The Christian life is not mechanical or automatic. It’s an organic and dynamic process. Don’t ever think that growing through the word of God is optional or marginal in the Christian life. Spiritual growth is absolutely necessary for every believer.